In an era of increasingly incendiary divisions — creating bridges becomes even more important. Marking the twenty-fourth anniversary of the Khojaly massacre, a group of Jews, Muslims and Christians gathered at a local mosque to offers prayers and words of consolation over a tragedy that occurred half-way around the world. We did so to show solidarity with the victims, survivors and the people of Azerbaijan and to demonstrate that religion can be a powerful force for compassion and healing. The event, jointly sponsored by the King Fahad Mosque, Pico Shul Synagogue and Azerbaijan’s Consulate in Los Angeles, marks the second annual event in Los Angeles commemorating Khojaly. The first event was held last year at Pico Shul Synagogue. We were honored to have the participation of Christian, Jewish and Muslim leadership including Bishop Juan Carlos Mendez of the Centro Cristiano Bet-El, Father Eamon Kelly, L.C., Vice Chargé at the Pontifical Institute Notre Dame of Jerusalem Center, Hypin Im, President and CEO of Korean Churches For Community Development; Rabbi Mel Gottlieb, President Emeritus of the Academy Of Jewish Religion; Steve Gilliland, Director of Interfaith Outreach for the Church Of Later Day Saints; Reverend Oliver E. Blue of Holman United Methodist Church; Rabbi Dov Cohen, Veterans and Prison Chaplain; and Imam Abdul Hafiz, Federal Muslim Chaplain of the Society to offer Prosperity & Peace. This remarkable collection of leaders and personalities is thanks to the dedication, friendship, and devotion to tolerance of Azerbaijan’s Consul General in Los Angeles Nasimi Aghayev and Mahomed Khan of the King Fahad Mosque. rabbiyonah.com/wp-content/uploads/2016/04/psalms-at-mosque-21.jpg?w=585 585w, https://i2.wp.com/rabbiyonah.com/wp-content/uploads/2016/04/psalms-at-mosque-21.jpg?resize=300%2C199 300w" sizes="(max-width: 585px) 100vw, 585px" /> Seated left to right: Rabbi Yonah Bookstein, Bishop Juan Carlos Mendez of the Centro Cristiano Bet-El and Mahomed Khan. se parents want them to see that they should not fear diversity, but respect other’s religions. The facts of the Khojaly massacre are tragic. On February 26, 1992, Armenian armed forces attacked the town of Khojaly in Azerbaijan’s Karabakh region. Witnesses and survivors have described in details the massacre, during which six-hundred unarmed civilians, including women and children were murdered. It was the largest massacre in the conflict. To this date, none of the perpetrators of this massacre of civilians have been tried, and even some hold positions of leadership in Armenia. After hearing from a survivor of the event Ansar Usubov and watching a filmed interview with Durdane Aghayeva, another survivor, we stood together in silence and then prayer. 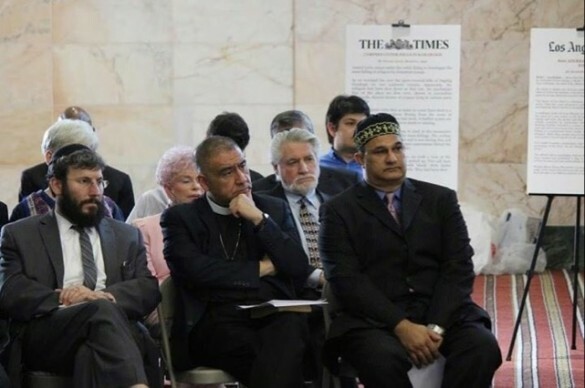 I recited a Hebrew prayer in memory of the victims standing together with a Bishop, Imam, and a Catholic Priest. After the event, we sat down together for a meal in the mosque’s social hall. One table with a Halal dinner and another table with Kosher catering. We dined and discussed the event and strengthened our resolve to speak out against intolerance and hate, and work towards forging ties of peace and harmony. While we can never bring back those who were gone, hopefully this event will help prevent future tragedies and bring healing to Azerbaijanis and the world.